Description: Attention all interested parties in buying a Historic Designation home in Tenafly's Attwood's Highwood Park Historic District. This stone house is referred to as the Paul Richter House and is among the most imposing houses in Bergen County that display the Four Square form. 191 Serpentine was designed by Fred C. Winter and the plans for this unique home were published in 1908 in the Architects' and Builders' Magazine. There are potentially 8 bedrooms, 3 full and 2 half baths, and 5+ fireplaces. 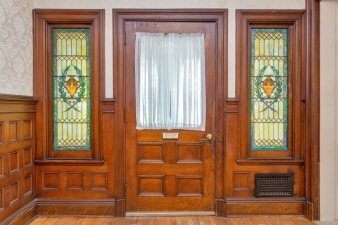 You'll notice the gorgeous original leaded and stain glass windows and stone fireplace as you enter the house.Conveniently located on the East side of town near shopping, transportation and Houses of Worship. Come take a look and bring this house back to it's original glory.